LOVE the bottom sample in the last pic! Cant wait for you to start! Well, I’m my own builder on this one so it’s my own schedule right now. All the subs are super busy, but with enough notice they all seem eager since I’ve got cash waiting for them when they are done. Right now I’d say we have another week of engineering, 3-4 weeks for permitting, a week until the layout/dig/steel gets going (plus a week of work) and then another week until Gunite so the plumbing sub can get in there and we can pass pre shell inspection. After that I’m less rushed since the worry for cave ins is subsided. So I’d guess 8 weeks from now I’ll have a shell, and probably double that for the complete project. Obviously I want the project done sooner than later, but I’ve accepted that we’re going to miss this swimming season this year. I vote for middle tile. It really caught my eye! So quick question to the group. I am currently debating the lighting for the main pool area and am between (2) of the Intellibrite lights on the south wall of the pool or (3) - (4) Globrite Lights on the same wall. Suggestions? Price wise they are similar, so look and distribution is the main factor. I will have (1) Globrite on the sunshelf as well as an LED bubbler. From talking to my pool builder, and i cannot speak for all, he said that the glo brites do not put out enough light. I have not seen any pools with them compared to a regular LED light, but in my pricing adventures you can get about 2 glo brites for one regular sized light. Just depends on how you want it to look. I think i would like the look of several smaller lights, but most dont seem to agree. Just a quick update (unlike this project progress). We got through permitting with the county and got our HOA approvals, so we are moving forward. I have an layout, excavation, steel sub that is currently getting me a schedule for their availability, and I am trying to chase down a flaky plumber. Access into the back yard has turned out challenging with my two options being to relocate both mine and my neighbors AC condensing units to get the clearance, or to drive through my other neighbors nice front landscaping. Hopefully we will be starting the dig at the end of this month, or beginning of October. Still trying to get the excavation crew out. We are having trouble with some access to the site due to how close our house is to our neighbors, but that should be remedied with a smaller bobcat. Hopefully we can get this started sometime next week. Also expecting the first of the parts to trickle in tomorrow (channel drain, skimmer and water leveler). 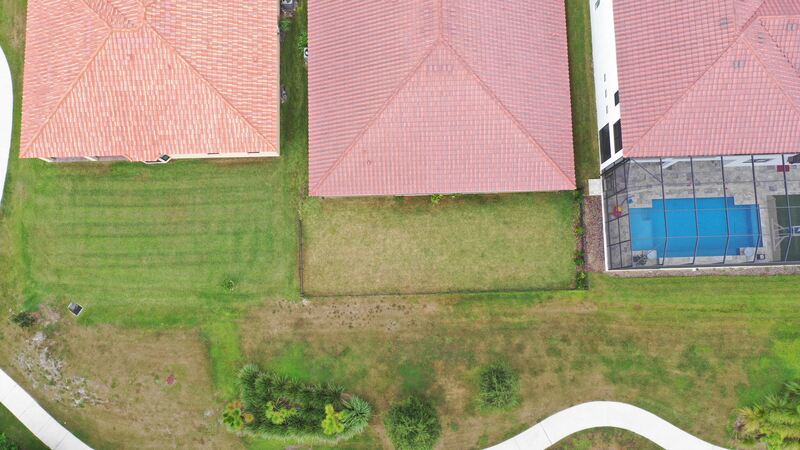 In the meantime, a quick photo showing the yard and how small of an area we had to work with. 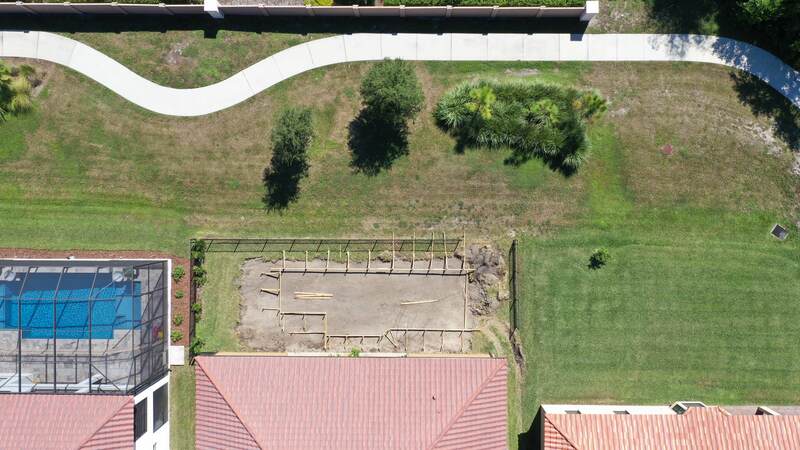 We will be accessing the yard from the left side of the house as shown in the photo (where the fence is taken down). How frustrating. Fingers crossed excavation starts soon. Our access was 1.2m at the narrowest. Equipment was teeny tiny. Read $$. SQUEEZE to the max! Going to need some good drivers to make that tiny space! Will you end up moving the AC units? i have 3 globrites in my pool. 36 feet long. 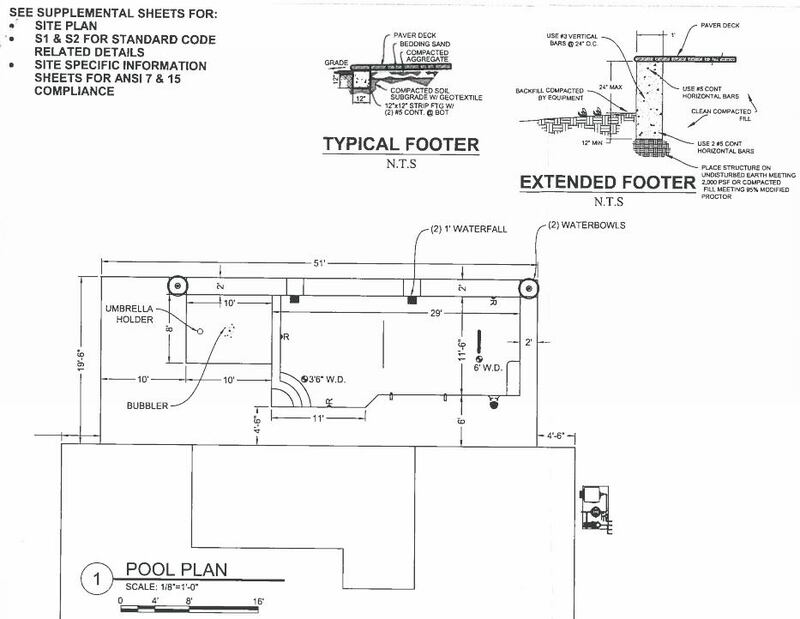 Each spread evenly across the pool which varies from 22-24 feet wide. No issues at all lighting up my whole pool. We kept the units in place and used some smaller equipment for shuttling the dirt to the front yard. The excavator will access the yard through the neighborhood common space (once in and once out), but we couldn't shuttle through there as I wanted to minimize damage to any areas that are not on my property. Thanks Jim, I ended up finding a neighbor with a similar sized pool that was using three for their lighting and went with the GloBrites as well. I was also planning on a dark finish, but with the RGB lights I might end up going lighter to take advantage of the color effects. Got some goodies delivered. I think I've got everything that needed to be purchased beyond basic materials, but I'm sure I forgot something. 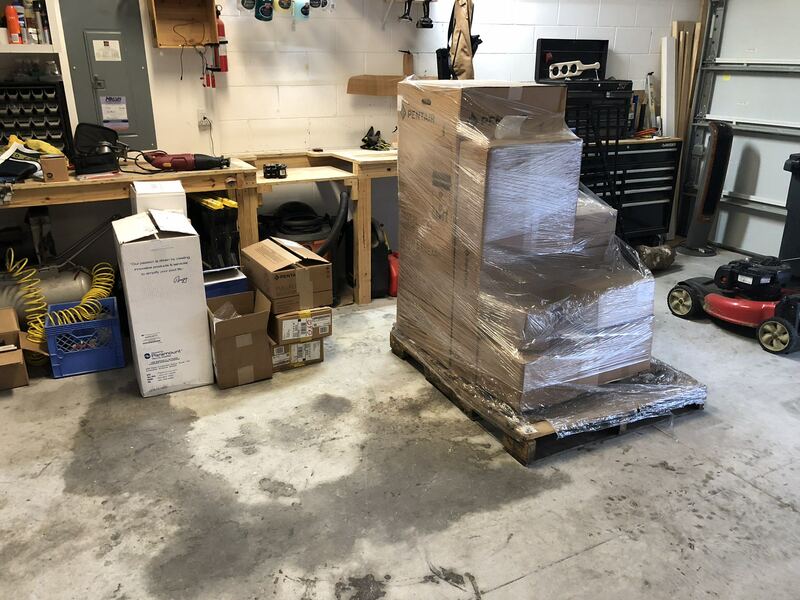 Drain, skimmer, water leveler, 18" waterfalls, lighting, valves and all filtration equipment was delivered over the past week. 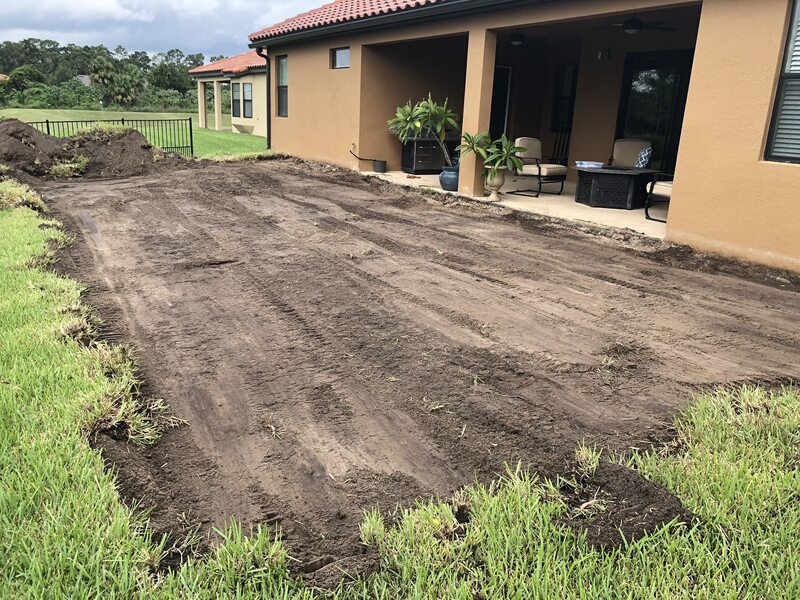 The excavation crew had to hold off a bit due to the weather in Central Florida recently, but we've finally started on the project in the yard. The grass was stripped yesterday and the layout was completed. 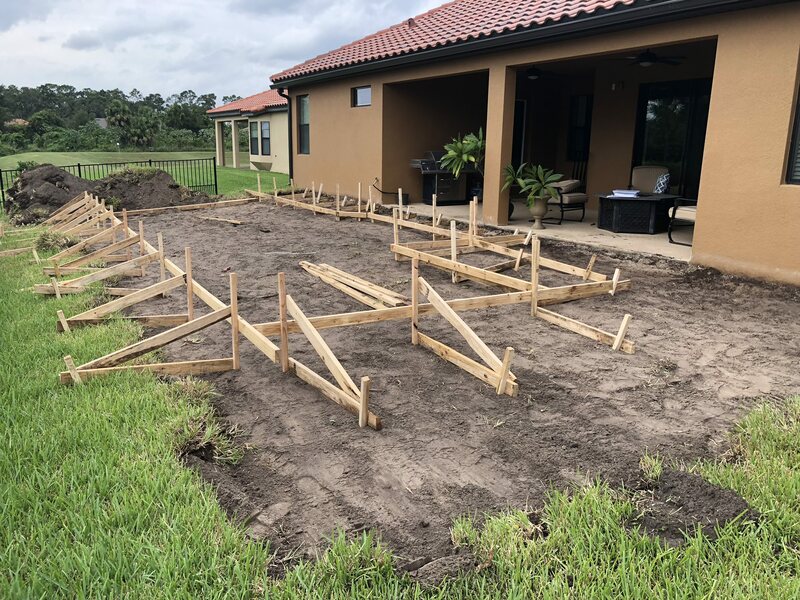 The crew was super professional and helped avoid an expensive conflict in the later parts of the construction (more on that below), while also providing some helpful insight to some later steps and cost saving opportunities. Sod stripped! Ended up being a full dump truck and then some. They left some sod off to the side which I'm guessing they will pick up tomorrow when they start the actual dig tomorrow. Layout complete! Really gives a sense of scale of the pool. The bond beam will be 8" thick, so the forms are set back 8" from the waters edge making it look slightly bigger than the pool will really be. So during the layout the lead on the crew noted to me that my patio ends right in the middle of the master bedroom window. Early on in the project I decided I didn't want to screen the patio and pool as I wanted it to be immersive in the yard landscaping. 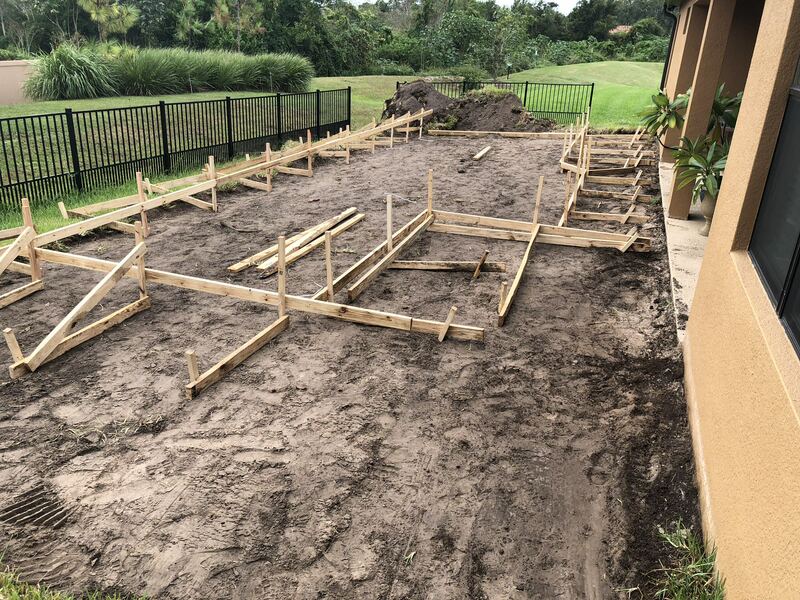 My wife on the other hand is a realist when it comes to the heat and bugs here in the area and wants a screen enclosure, so we compromised and are having the screen footers poured during the build so a screen can be added easily later. This means if we were to install a screen as built it would be in conflict with the master bedroom window. The result is the patio getting extended all the way to the edge of the house on both sides, losing 4'-6" of landscaping space (almost half), but we have the benefit of the deck getting larger on the lounge side which I think everyone will enjoy. The second good catch by the crew was their suggestion to not shoot the columns integral to the pool shell. The cost of gunite vs poured concrete would have caused the columns to be about $1k more expensive than if the were formed and poured after the fact. We will leave some steel sticking out of the shell to tie the column footer to the pool shell, but the dry joint between the two will allow movement (hopefully not) without stressing the pool shell. Ultimately we will have a cheaper and better construction method for the columns. Hopefully more pictures and progress to come this weekend! SCORE! Those are some good suggestions! Loving how it is all coming along together! If your happy with your subs so far, I'd love to hear who you used. Great job so far, keep the pictures coming! BTW, I have a square version of your top tile and they look awesome installed! Where did you get them? 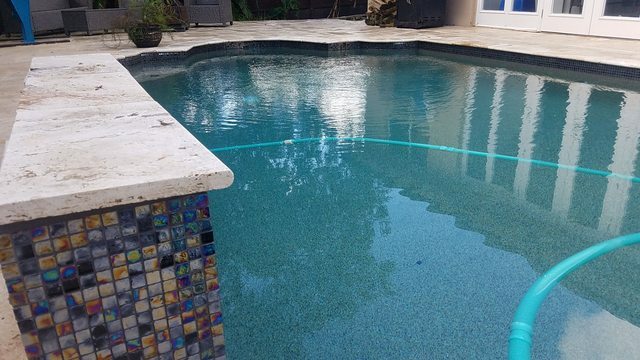 I am also an engineer in Oviedo, I'm a mechanical, and did my own pool last year. You'll be great, don't worry about anything along the way, and just come here for questions. We will all help as best we can. Great progress! Invaluable advice from your subs. That’s how you build a good pool. I can picture it now that the forms are up. Your backyard will be amazing! Thanks Kim, we're excited over here. Agreed, just need them to get back out here and finish up! Love the tile in your pool, but unfortunately I don't think that is what we're going to be going with. I've been really enjoying leading this project myself as I think the material and equipment selections are way better than what any of the builders would have pushed me towards. For contractors we are using HSJ Excavation to get through steel, then probably Elite Gunite for the shell. I have a plumbing guy lined up, but if you have a recommendation on who you used and could PM their contact that would be great as this guy is a little non-responsive. Thanks! Hopefully we'll have more actual pictures soon! Just started the dig this morning. The crew is knocking out the dig, deep plumbing and steel on the same day, so there should be some good update photos this evening! In the mean time, got another drone shot of the layout. I thought we were building a pretty small pool, but it looks to be the largest in the neighborhood after a quick flyover.